A college student accused of slashing a taxi driver because he is a Muslim was moved from jail to a psychiatric ward, corrections officials said Friday. Michael Enright, 21, was accused of using a folding knife to slash the face and neck of the driver, Ahmed H. Sharif, an immigrant from Bangladesh, on Tuesday night after asking whether he's a Muslim. Enright was moved from the Rikers Island jail to Bellevue Hospital on Thursday night, said Correction Department spokesman Stephen Morello. Police Commissioner Raymond Kelly said it wasn't clear why he had been moved. Kelly said authorities see the attack as an isolated incident rather than evidence of a trend in anti-Muslim crimes. Investigators obtained a warrant to search Enright's six journals, but did not find any anti-Muslim statements. Kelly described the journals as a chronicle of his time in Afghanistan. Enright traveled there in April on a trip he took as part of a senior video project he was doing at the School of Visual Arts. As part of the work, Enright spent time embedded with U.S. troops. The handwriting was difficult to decipher, and Kelly said officials have not done an in-depth analysis of the journals, but the cursory look did not reveal a motive or a deep-rooted racism. The journals do, however, detail Enright's drinking, and there was some indication that he had been in Alcoholics Anonymous, Kelly said. But it hasn't yet been determined if he has a serious drinking problem. Police said he was drunk at the time of the attack. Nazmul Ahsan Kalimullah, who teaches politics and public administration at Dhaka University in Bangladesh, said the assault was at odds with American values. "We worry more because there are many Bangladeshi taxi drivers in America," he said. "They behave as patriotic American nationals more than they consider themselves Muslims or Bangladeshis. Such violence against them is not desirable, and we believe all believing in democracy and liberty will condemn it." Waliur-ur Rehman, who heads a think tank, the Bangladesh Institute of Law and International Affairs, said he recognized that the majority of Americans are opposed to such violence. "This is not the America we want to see. This is not Jefferson's America, this is not Kennedy's America," Rehman said. 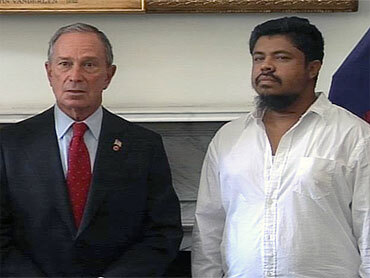 Mayor Michael Bloomberg met with Sharif at City Hall on Thursday. Bloomberg said it is impossible to know the motive for the attack, but he made a pointed connection to the debate surrounding a planned Islamic center and mosque two blocks from the World Trade Center site, which has ignited intense emotions worldwide. There are nearly 7 million Muslims and more than 1,200 mosques in the U.S. but a CBS News poll found 71 percent of Americans say it's inappropriate to build a mosque so close to ground zero. Sharif said the topic did not come up in his conversation with Enright. "Of course it was for my religion. He attacked me after he knew I was a Muslim," Sharif said at a news conference. Bloomberg said: "Hopefully, people will understand that we can have a discourse. That's what the First Amendment is all about. That's what America is all about." Kelly said Friday he told Sharif he was lucky to be alive. "The first stroke was against his neck," Kelly said. In an interview Thursday on New York radio station WOR-AM, Gov. David Paterson said that even if Enright actually discussed the driver's religion before the slashing, such crimes often involve underlying mental health problems. The governor said the driver's religion may not have prompted the attack. Paterson said such cases compel New Yorkers to remember that terrorists want Americans to fight among themselves.